Sealing of the borders with Bangladesh will be completed in two year's time to put an end to infiltration, Assam's Chief Minister-to-be Sarbananda Sonowal said on Saturday. A product of the student movement of the 80s during the anti-foreigners agitation, Sonowal, who steered the BJP to victory in the elections, has put the issue of infiltration and attempts to check them as his government's priority. BJP had made infiltration one of the major issues in the poll campaign. "Union Home Minister Rajnath Singh had given a two-year time frame for permanent sealing of the border. We will work towards finishing within that time frame the border sealing work, including the riverine border," he told PTI in an interview. He was asked how he intended to seal the Indo-Bangladesh border, an issue he spoke about soon after his party romped home in the election on Thursday. Rajnath Singh had during his on-the-spot visit to the Indo-Bangla border in Karimganj district of southern Assam in January this year had said construction of the barbed wire fence along the Assam stretch would be completed by the end of this year. "As soon as the border is sealed permanently, the infiltration trend will stop automatically. Plus we will create awareness among the people to prevent infiltration", he had said. Asked what method or law he intended to apply to stop infiltration from Bangladesh as he was against the now repealed IMDT Act, Sonowal said, "When the final draft of the (ongoing) updated National Register of Citizens in Assam is published, it will be clear who the citizens are and infiltrators will get identified. "The problem will get solved and action will then be taken against infiltrators as per existing law. Like the Wagah border in Punjab with Pakistan, we will also have a similar ceremony in Assam along the Indo-Bangladesh border. We will make it into a tourist spot where people can come and watch the ceremony. This will also stop infiltration", he added. 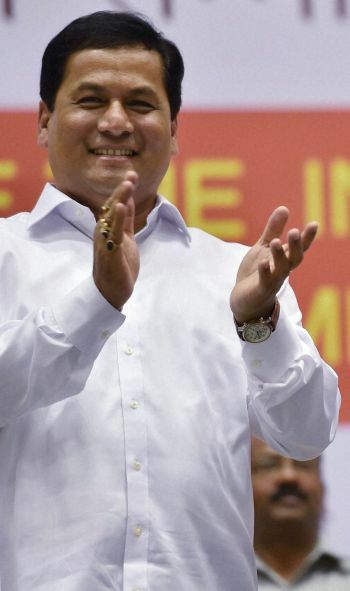 On the election victory, Sonowal gave the credit to his party and its alliance partners for "taking together all ethnic groups, giving them respect and representation". "Also acceptance by the people here of Prime Minister Narendra Modi's development model of directly linking Centre's development programmes with the states," he said. Asked if anti-incumbency and voter fatigue were factors for his alliance's historic victory, the BJP state president said, "There was no anti-incumbency factor. It was the rampant corruption and lack of development during the last 15 years of Congress rule that was another cause for our victory". Asked if the BJP's alliance with regional parties Asom Gana Parishad and Bodo Peoples Front was a plus point for the saffron party, Sonowal said, "Of course people accepted that and gave us their mandate. We took along with us the tea tribes, the various ethnic groups across the state with us". "We did not leave anybody. We even went to those pockets in BarakValley where there are ethnic groups of just 2,000 people. We talked with them, gave them respect and representation. People want their culture and identity to be protected", he said. On minority support to the BJP during the just-concluded hustings, he said, "Both indigenous Assamese and other minority communities supported us and they contributed to over 20 per cent of our vote share". "They came out in large numbers in support of us and their support here (Assam) was perhaps the highest in India. Because of their support our minority candidate won", he said. The BJP government would take oath on May 24 here at the Khanapara Field in the presence of Prime Minister Narendra Modi, Sonowal said. According to BJP national general secretary Ram Madhav, the mandate was for protecting the identity of the people of Assam and also for development. Maintaining that the party viewed the demography as a challenge, Madhav said BJP concentrated on Upper Assam and tea gardens, considered to be traditional Congress strongholds. The BJP-lead alliance won 60 of the 126 Assam assembly seats with its poll partners AGP winning 14 and Bodo Peoples Front 12 seats. BJP putting up 89 contestants for the 126-member House along with its alliance partners AGP and BPF in 30 and 13 constituencies respectively, they together won 86 seats garnering 41.5 per cent vote share with 7035724 ballots. The BJP alliance swept the polls with 86 seats leaving only 26 to the ruling Congress, 13 to the major opposition AIUDF led by Badruddin Ajmal who lost and one to an Independent. AGP president Atul Bora said, "The people wanted a political change and they supported the BJP-AGP-BJP united fight". "It was a vote against a corrupt Congress government which did not work for the development of the people", said the leader of the AGP which had ruled the state for two terms. Echoing similar views, AGP Publicity Secretary Manoj Saikia said, "Our alliance gave importance to all the people, including ethnic groups and minority communities. The minority community supported us in Barpeta, Bongaigaon, Koliabar, Berhampur where they are in large numbers leading to the victory of our contestants", Saikia said. BPF leader and Bodo Territorial Council chief Hagrama Mohilary said the landslide victory was due to people wanting a change in the state and, therefore, gave their mandate to the BJP-AGP-BPF alliance. Modi's ministers: Who will stay, who will go?